Last week Chairman Dave Camp of the House Ways and Means Committee delivered the details on his tax reform plan that lowers tax rates and broadens the base in a revenue-neutral fashion. Indeed, it lowers tax rates in many cases, and the Joint Tax Committee (JCT) has scored it as revenue-neutral according to the official rules of Congress. That sounds like a win, but not far below the surface lurk a number of troubling aspects. In general, Camp simplifies and lowers tax rates for many taxpayers and businesses, but does so through a net tax increase on businesses and taxpayers earning over $200,000. As a result, the plan makes the individual tax code even more progressive, it increases the amount of redistribution from high-income taxpayers to other taxpayers, and it worsens the current bias against saving and investment—all of which will be a drag on long-run economic growth. Camp simplifies the tax code for individuals in a number of ways, most clearly by reducing the number of tax brackets from the current 7 to just 3 with a top rate of 35 percent rather than the current 39.6 percent. Camp also eliminates the Alternative Minimum Tax (AMT), replacing it with a comparatively simple 10 percent surtax on high incomes (which produces the top rate of 35 percent). However, the 10 percent surtax has its own complexity, such as a special carve-out for manufacturing income and the inclusion of fringe benefits, but it appears to be simpler than the AMT. The plan also expands the standard deduction, reducing the need for millions of low- and middle-income taxpayers to itemize their deductions. Camp’s plan simplifies taxes for multinational corporations, by ripping out much of the code dealing with foreign income. He does this by switching to a territorial tax system that exempts 95 percent of active foreign income, which is the standard approach among developed countries. The plan also cuts the corporate tax rate from 35 percent to 25 percent, which reduces many of the distortions inherent in corporate taxation such as the double taxation of corporate earnings, i.e. first by the corporate tax and then by capital gains and dividends taxes. The lower rate is also closer to the average among developed countries (though still 5 points above the average), which may help stem the tide of corporations leaving the U.S.
Camp chose to follow the usual practice in Congress that legislation must be revenue-neutral in the static sense, meaning ignore all effects on economic growth. This was ill advised, since cutting tax rates tends to generate economic growth which, in turn, produces more tax revenues and, thus, reduces the amount of base broadening that is needed to insure revenue-neutrality. So rather than counting on the revenue feedback effects of cutting the corporate tax rate, the plan had to be “revenue neutral” by raising corporate taxes elsewhere. We find similar results when modeling Camp’s cost recovery and lower corporate tax rate. Camp deserves credit for at least indexing the slower depreciation to inflation, but under normal inflation conditions Camp’s depreciation system is still worse for investment than under current law. It will hurt capital intensive industries, such as manufacturing, and reduce jobs and wages in those sectors. The growth that JCT predicts from Camp’s proposal is entirely from the reduction in taxes on labor and the increase in consumption due to more income. These are short term effects that fade away outside the 10 year budget window that JCT analyzes, according to standard models of long-term growth (see for example the Heritage model or the work of Jane Gravelle at the Congressional Research Service). We are currently modelling the Camp proposal, but it is safe to say the higher long-term capital costs will be detrimental to investment, productivity, real wages, and, ultimately, long-term economic growth. 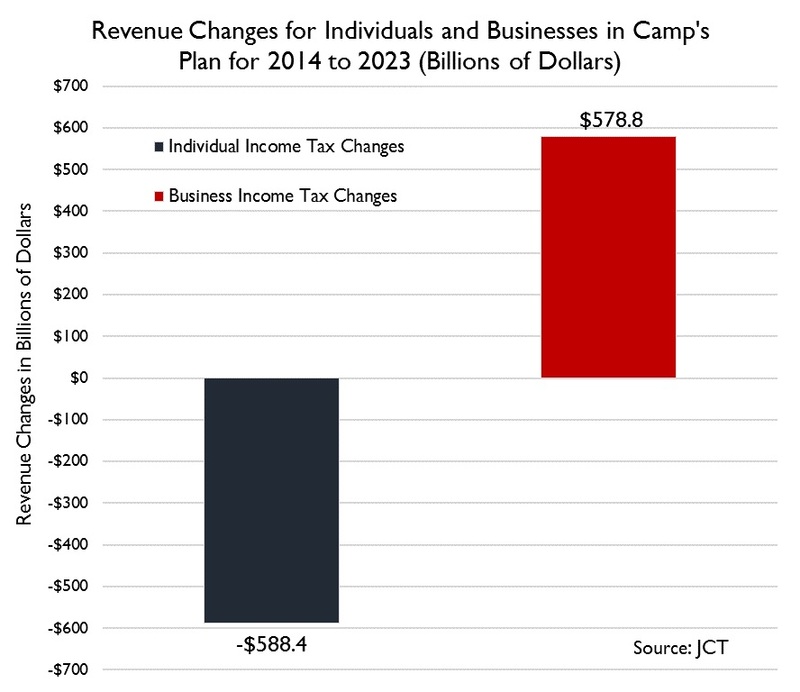 The chart below, drawn from the JCT analysis of the Camp plan, indicates a shift in the tax burden from individuals to businesses of almost $580 billion. To some extent, some of these tax increases on businesses will be matched by some reduction in the tax burden of pass-through entities that are taxed as individuals. Unfortunately, the JCT tables do not provide enough information to know how much of these higher business taxes translate into lower pass-through tax rates. In particular, pass-through entitites will be impacted by the proposed changes to such provisions as MACRS, the R&D tax credit, LIFO, and the manufacturing deduction. However, JCT has blended these revenue increases on pass-throughs with the revenue increases on C-corporations, so we don't know what the total impact of this base-broadening is on pass-throughs. On the flip side, the JCT tables make it impossible to know how much of the roughly $580 billion net tax reduction for individual taxpayers benefits pass-throughs. Indeed, many pass-through businesses will be exempt from the 10 percent surtax and will also benefit from the elimination of the AMT. It would be helpful if JCT and Ways and Means staff accounted for both sides of these effects on pass-throughs in separate tables. The bottom line is that, to some degree, the plan would lower the tax burden on individual taxpayers at the expense of U.S. buinesses, despite the fact that U.S businesses are already taxed more heavily than businesses in nearly every other developed country. 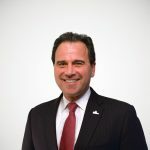 To the extent that the Camp proposal does increase taxes on business to expand tax relief to non-business taxpayers–such as through a more generous child tax credit, an expanded standard deduction, and lower tax rates on wages and salaries–it would be bad for the economy and U.S. competitiveness. This was one of the mistakes of the Tax Reform Act of 1986, which depressed investment and slowed the economy later in that decade. Camp sought to maintain the current progressivity of the tax code, but it appears that the plan actually increases it—according to the JCT’s distributional tables—even while it cuts individual tax burdens overall. Once again, however, JCT's tables raise as many questions as they answer. For example, below is a chart illustrating JCT's estimate of the plan's proposed changes in federal tax revenues for each income group in 2021. As the chart shows, when JCT accounts for all of the changes in individual taxes, business taxes, and excise taxes, the tax burden for taxpayers earning under $100,000 is expected to fall by more than $56 billion, while increasing by $19 billion for taxpayers earning over $100,000. 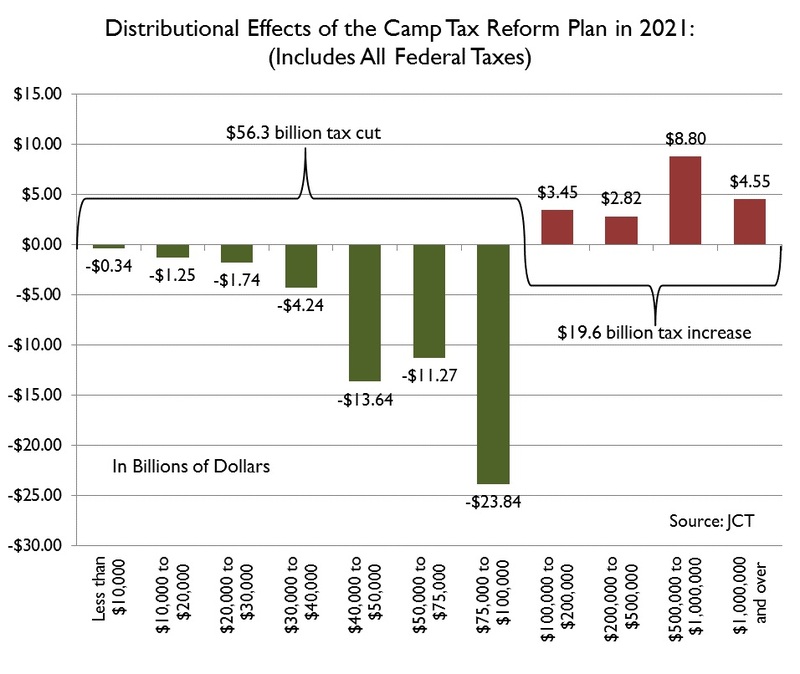 Although the Camp plan is intended to be revenue-neutral, JCT's distributional tables show a net tax cut each year–for instance, a $36.7 billion net tax cut in 2021. An explanation for this disparity is that there are provisions in the plan that JCT could not decide how to distribute to individual taxpayers so they left these figures out of the table. One example is the corporate taxes paid by foreign shareholders, who JCT estimates bear about 10 percent of capital's share of the corporate tax burden. While certainly difficult to distribute to domestic taxpayers, higher taxes on foreign owners of capital will raise the cost of capital for U.S. firms, thus effecting domestic taxpayers in the long run. Indeed, to the extent that these unallocated tax increases ultimately fall on owners of capital–who tend to be upper-income taxpayers–JCT's tables likely understate the plan's impact on progressivity. It is worth noting that the U.S. already has the most progressive tax system in the developed world, according to the OECD. And, economists at the OECD and elsewhere have found that progressivity is associated with slower economic growth. Dave Camp went to a considerable effort to lower tax rates within the restrictions of revenue-neutrality. However, some of the methods that were used to achieve these objectives appear to be gimmicks that just clutter up the tax code and target politically unpopular industries. For instance, there doesn’t seem to be a good policy basis for the proposed $86 billion bank tax or the $76 billion tax hike on insurance companies except to raise revenues. As Alex Pollock points out, if the bank tax is supposed to tax “systemically important financial institutions”, why are Fannie Mae and Freddie Mac excluded? The effort to get rates down is in many cases completely undone by various hidden provisions that effectively raise marginal tax rates, such as the phase-out of the 10 percent bracket for high-income earners. The definition of income is also expanded in some novel and complicated ways for high-income earners, such as the inclusion of fringe benefits, retirement saving, and foreign income. There is also an excessive amount of arcane rules targeting a tiny minority of high-income earners, who will probably find ways around them. For instance, the plan proposes to limit the ability of businesses to deduct compensation paid to the top five executives, even though similar rules implemented in the 1990s lead to excessive use of options. Lastly, as many have pointed out, Camp' plan appears to play some games with the 10 year budget window, as some of the out year effects are not taken into account by JCT. However, what is more important than whether or not the plan is revenue neutral within the arbitrary 10 year budget window is its effect on long-term economic growth. The concern is that the plan’s effect on increasing the cost of capital and the tax code’s progressivity will likely slow economic growth long after the budget window.